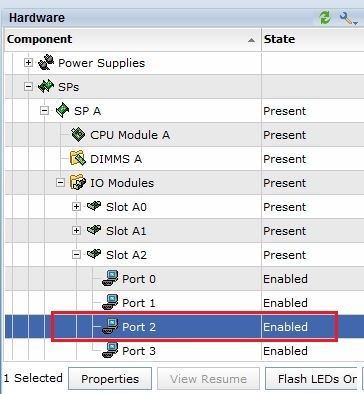 Somtimes you may have encountered an issue where a VNX/VMAX front-end port gets cabled to the wrong MDS Switch Port that you had designed for and in fact the port description that was applied to the MDS Port is incorrect. In this case it is invaluable to have a command to verify the VNX/VMAX port connected to the MDS. There are many situations where this command would be useful; for example you may not have the ability to do a physical check as the DC is remote and you need to ensure the interface description that you are assigning the MDS FC Port is correct and resulting zoning configurations are accurate. Confirming these connections remotely through a command on the MDS is very benneficial during these types of situations. Else you may end up zoning to ports you did not design for. From this result we can see that the port was labeled as per design as VMAX 9G:1. Now we need to confirm this is the actual port connected to FC2/37. 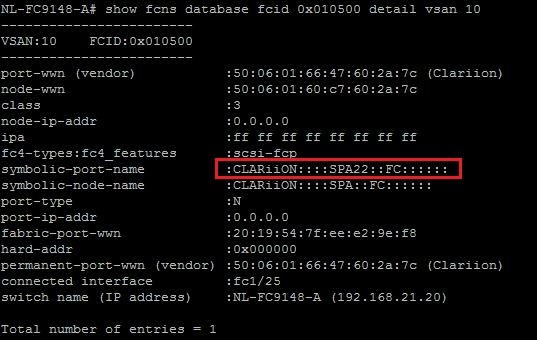 Note: FCNS = Fibre Channel Name Server. From the output we can confirm that there is a problem; the expected VMAX Port was 9G1 but in fact 7G1 is the VMAX port patched to FC2/37 (SYMMETRIX::000195701570::SAF- 7gB::FC::5876_229). Thus either we update the description of the interface or have the correct VMAX Port patched. From the output we can confirm the correct port is connected from the VNX. From the output we can see that SPA_6(Logical Port) is connected to the MDS interface WWN 20:19:54:7f:ee:e2:9e:f8. Thus we can conclude from this output that the VNX Physcial Port SPA:2_2 is connected to MDS Port FC1/25.